Problem: Site conditions included chronic bank erosion of 70ft bluffs that have little or no sand. The site has a long fetch exposure to the south of over 12 miles and the southwest of over 5 miles. Wind frequencies from these directions are about the same, and the site occurs in what is considered a bimodal wind/wave setting. 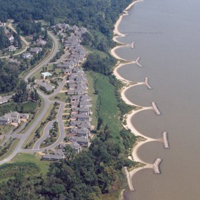 The developer of the upscale residential community wanted shore erosion control with environmental edge. A 2,800 ft breakwater system was installed in 1996. It consisted of six headland breakwaters ranging in size from 115 ft to 210 ft, a 110 ft low breakwater and a 170 ft revetment for boundary interfacing structures, beach fill, and wetlands plantings, all of which were designed for a 50-yr storm event. The site's seventy foot high banks had little sand and posed potential upland drainage problems. The design routed upland drainage to an adjacent marsh, and low swales in the bank were used to allow storm water to diffuse through a vegetated beach fill. Beach fill was obtained from an upland borrow pit. The design utilized existing reach morphology and shore erosion patterns along with a hydrodynamic analysis which included SMB, RCPWAVE, and SEB models for a bimodal wave climate.